We do not actively market our plaques and if you receive an email in relation to such a product it is NOT from Doyle’s Guide – various entities such as Showmark Media regularly market such products to individuals included in our rankings. Our stylishly modern black acrylic plaques reflect the branding of Doyle’s Guide and has a piece of clear acrylic raised above the black acrylic backing plaque by four silver standoffs. Your ranking, practice area and jurisdiction are engraved on the acrylic for an impressive modern look. An example of our plaques can bee seen pictured right. This plaque can be displayed on your desk or hung on the wall. 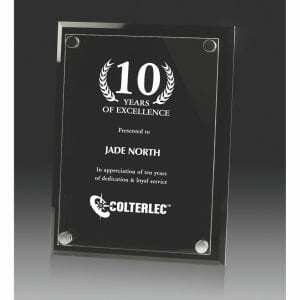 These plaques are priced at $149.95 and can be purchased below. Our awards come in either of a glass or crystal – both awards are visually similar. The glass award is an affordable way to highlight your ranking inclusion. Your ranking, practice area and jurisdiction are engraved on the glass. 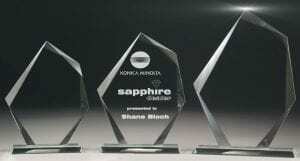 The crystal award with bevelled edges is classic and simple, and of higher quality materials. Made from 30mm thick crystal, your ranking, practice area and jurisdiction are engraved on the front. Should you wish you are also able to purchase a Ranking Recognition banner package for yourself/your firm separately from a Featured Photo. These banners are designed to be displayed on your firm’s website or your email signature as a recognition of your ranking and affirmation of your expertise. High-resolution copies are able to be provide for print publication. You can purchase the Ranking Recognition Banner for your country or jurisdiction at our Featured Photos page.